The PDI Act 2016 provides for the new SA Planning Portal, a one-stop shop website for information, online services and community participation relating to the South Australian planning system. South Australians will now have the planning information they need at their fingertips, and will be able to access the planning system 24 hours a day using their computer, phone or tablet. SA Planning Portal launched December 2016 and has continued to grow and evolve with new content and capabilities. Online Submissions Form launched to enable online submissions on planning matters that are on consultation such as Ministerial Development Plan Amendments (DPAs). Single Land Use and Land Division Public Development Application Register available for viewing. State Planning Commission website available with information on Commission members and the new planning system. Council Connect provides an online collaboration tool for councils to engage with each other and DPTI. This is a secure environment where participants can contribute to various forum discussion topics relating to the Planning Reform program. Updating the public register to enable development applications to be viewed spatially on a map. Please continue to ask us questions on ePlanning on either Council Connect or by emailing us at DPTI.PlanningReform@sa.gov.au. Can councils still undertake assessments in existing systems, or are assessment tasks undertaken completely within ePlanning? Assessment of all development applications will be undertaken solely within ePlanning, with no duplication in a council system. ePlanning will be the single source of truth for all applications lodged under the PDI Act. Will ePlanning have a record management system and capture the documentation of an assessment, or will council need to store documents on their own records management system? Records management will be supported by ePlanning with no need for councils to duplicate records within their system. Yes. Both planning and building consents will be undertaken within ePlanning, enabling end-to-end processing of a development application in one location. Mandatory notifications will be included in the workflow, along with other processes, until certificate of occupancy is attained. Will building rules assessment be undertaken in ePlanning along with mandatory notifications? Will ePlanning decide which category of assessment an application falls within? Depending on the entry criteria in ePlanning (for example, selecting a parcel of land, or nominating a specific type of development, such as a shed) answering a series of criteria-based questions will return a suggested pathway for users, along with the relevant rules according to the Planning and Design Code. This will then be verified and confirmed by the relevant authority prior to lodgement. Will assessments be undertaken in hard or soft copy? 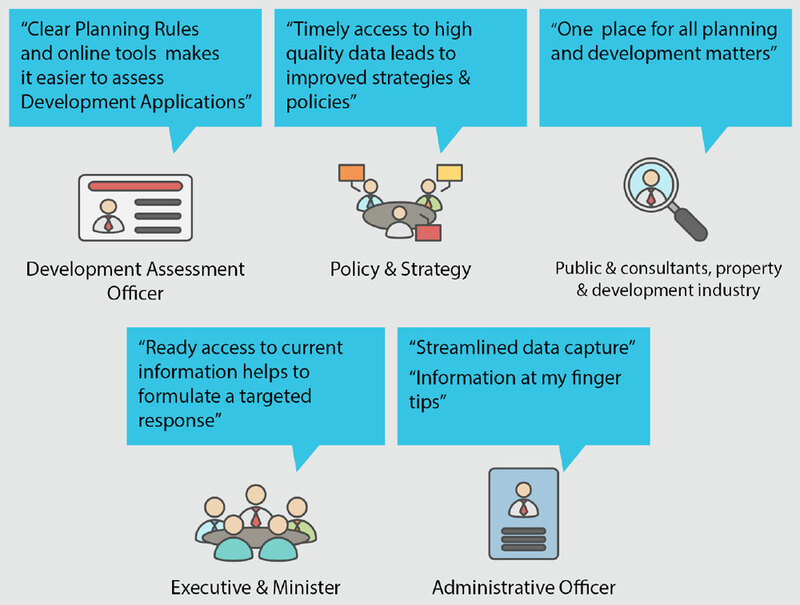 The PDI Act supports a digital approach to assessment, with information filed and stored in ePlanning, accessed via the SA Planning Portal platform. Application assessment should be undertaken electronically, with business processes supported by technology. Can applications be lodged in hard copy format? If an application is submitted in hard copy format to council, council is responsible for converting the submitted information into an electronic format and uploading it to ePlanning to ensure all applications are assessed and recorded electronically. Will ePlanning integrate with an existing council system? No. Assessment will be wholly undertaken in ePlanning. There is no potential for technology integration in order to be able to undertake full end-to-end assessment of applications. Will councils be able to maintain their own users within the system? Yes. A council will have the ability to assign various user roles to officers within the council. This may include assessment officers, team leaders, administration officers etc. This will assist councils to maintain their own applications within a team hierarchy to ensure structured outcomes. Can an officer see all their files and their status, and can they limit accessibility to certain information? Each user will have an individualised account where they can track and interact with their own applications. This will show assessment timeframes, current status and other critical functions and information related to application assessments. Only certain pieces of information will be available to members of the public. Legal advice, for example, can be maintained confidentially. Will a council, or council officer, be able to generate reports about specific activities as part of application assessment? ePlanning information will be located in one place, which means more efficient, easier monitoring and reporting. This also allows for significant improvements to information collected and the sort of reports that can be generated. This is particularly useful for external agencies such as the ABS and SVO, for example, who require regular, detailed information about assessment of applications.